A recent visit to the V&A really has got my brain working. 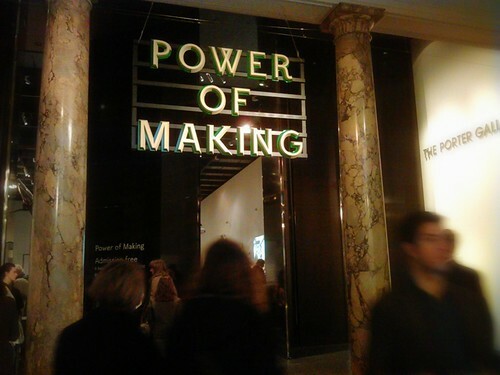 An exhibition called The Power of Making, a V&A and Crafts Council exhibition, featuring artist, designers, engineering and scientist. On arrival you are greeted by a giant Gorilla sculpture made from coat hangers by David Mach. The Power of Making is filled with different materials, different use of techniques different ways of putting materials together, making objects, making machines to make objects and new materials. You can see the pencil tip sculptures showing the intricate detail of 26 pencil tips, each one with a letter of the alphabet, produced by Dalton Ghetti or the MakerBot Thing-O-Matic or the wooden textile by Elisa Stroyzk, made of different shades of maple wood addisived to cotton material or the Rapid Prototyped Shoe by Marloes Ten Bhomer created using a 3D Prototyping machine (additive manufacturing) meaning being produced by layers and layers of material as to solid material parts being bonded together. All projects were amazing to see. I only wish this exhibition was a tactile one! All the objects were calling to be touched and examined!